NETWORK UPDATE: SVU rose 0.1 in final numbers, although the CHICAGO FIRE rerun at 8PM lost 0.1. Elsewhere, there were also 0.1 gains for SURVIVOR and CRIMINAL MINDS, as well as for ARROW. CABLE HIGHLIGHTS: Neither of the night’s premieres even made it to our supplemental chart. The first 2 hours of HBO’s J.K. Rowling miniseries THE CASUAL VACANCY (the final hour will air Thursday) was at 0.06 in 18-49s with 221K total viewers, and BBC America’s RIPPER STREET was at 0.02/197K. At the other end of the night, TNT’s NBA PLAYOFFS doublefeature led Wednesday at 1.28/0.75. Lifetime’s TERRA’S LITTLE FAMILY, at 0.55/0.50, was down from last week’s 0.63/0.57, and lead-out LITTLE WOMEN NY was up 0.06 to 0.43. CATFISH (MTV) dropped 0.16 to 0.52. Bravo’s MILLION DOLLAR LISTING fell 0.08 to 0.44. 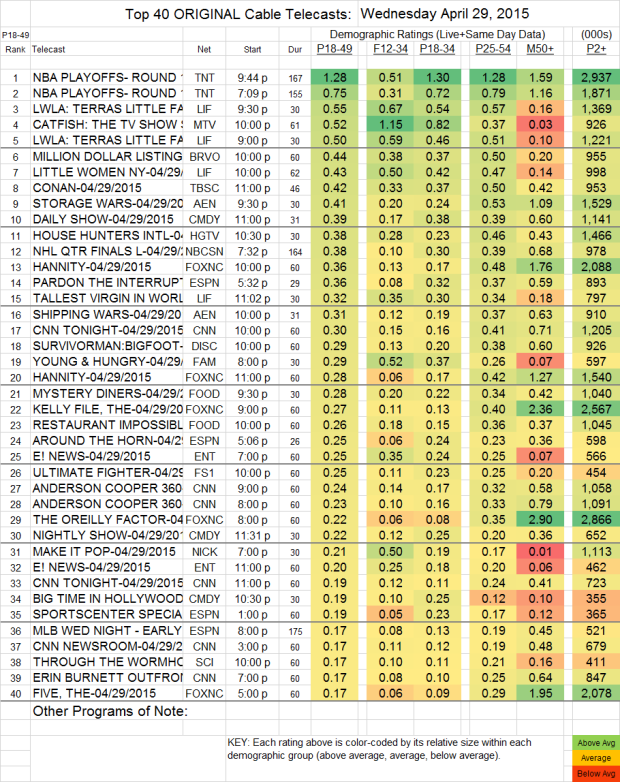 On A&E, STORAGE WARS was steady at 0.41, and SHIPPING WARS also held at 0.31. Discovery’s SURVIVORMAN BIGFOOT dropped 0.05 to 0.29. On ABCFamily, YOUNG & HUNGRY was off 0.14 to 0.29, and FREAK OUT lost half its 18-49s, down 0.06 to 0.06 (with 122K total viewers). BIG TIME IN HOLLYWOOD FL (Comedy) stayed at 0.19. HOT IN CLEVELAND, SOUL MAN and INSTANT MOM changed things up a bit this week, airing on TV Land and Nick Jr rather than Nick At Nite. On TV Land, CLEVELAND was steady at 0.14, SOUL MAN rose 0.02 to 0.11, and INSTANT MOM was also up 0.02 to 0.09. On Nick Jr, CLEVELAND added 0.09/350K, SOUL MAN added 0.03/161K and INSTANT MOM added 0.03/142K.